It all makes sense, once you know what you’re looking at. The 200 acres of thickly wooded hillside, inaccessible by public footpath; the radio mast strategically poking out on top; the hidden entrance, just off the A44 near Evesham, in Worcestershire, surrounded by CCTV cameras and a high-security barrier. But to the passing motorist, there is nothing about Wood Norton Hall to identify it as the site of the BBC’s secret nuclear bunker. Who knew there even was such a thing? The BBC would certainly rather we didn’t. It emerged recently that, from tomorrow, the continuity announcers at Radio 4 will decamp there for three weeks while a £1bn refurbishment is finished at Broadcasting House, London. However, a corporation source declined to confirm or deny the story. They would rather not discuss what goes on at Wood Norton, she said, and no, The Independent on Sunday was certainly not welcome to come and visit. So, what don’t they want us to see? According to the official line, Wood Norton is a training camp, where sound engineers are sent for residential weekends. That is certainly one function: zoom in on Google Earth and you see a compound of modern buildings nestled in the woods which, according to engineers who have visited the site, are equipped with the latest high-tech facilities. Other blocks house accommodation and a canteen. But it’s what you can’t see from above the ground that is intriguing. Buried 10 storeys into the hillside is a fully functioning nuclear bunker, built at great expense in 1966, at the height of the Cold War. So few people knew of its existence that, even when it was being built, visiting trainees were told not to ask why all that concrete was being mixed. Those involved in its construction were obliged to sign the Official Secrets Act, and even now you won’t get a peep out of the BBC press office to acknowledge the reality. Measuring 175ft long, the bunker – known to high command as Pawn: Protected Area Wood Norton – remains ready for service in the event of an attack on London. It is said to have beds and ping-pong tables and is connected by tunnels dug into the hillside to a mast on top of the hill which is fitted with a super high-frequency satellite dish. 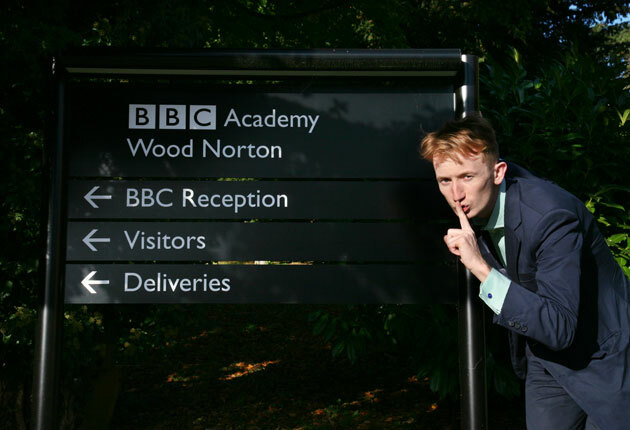 According to the Government War Book, a Cold War document that was declassified only last year and which sets out what happens in the event of a nuclear strike, Wood Norton was a vital tool in keeping the country informed should chaos descend. While the Cabinet would be secreted away in another bunker in Corsham, Wiltshire, pre-recorded tapes kept at Wood Norton would be broadcast across the nation in the minutes before any bomb was dropped. It’s a chilling scenario, one that has thankfully been relegated to a distant memory. The question is why now, 20 years on from the end of the Cold War, do we still have it? The story began in 1938, when the BBC’s defence committee set about making plans in the event of London having to be evacuated. Wood Norton Hall, a baronial country house on the edge of the Cotswolds, was bought and equipped in total secrecy four months before war broke out. There has been a dwelling on the site since medieval times but the current house was built in a high Victorian, Cluedo school of architecture. Wood Norton was the last English home of the Duc D’Orleans, pretender to the French throne. You can still see the Duc’s fleur-de-lys motif plastered on the stone piers at the gates to the estate and embossed on to doors and windows. But it was the acres of wooded grounds and, vitally, a prominent south-facing hill, that made Wood Norton so attractive. It would double up as the perfect listening station, becoming home to the government’s monitoring service. It soon became a kind of parallel Bletchley Park: dozens of huts were knocked up in the grounds and bright young linguists were bused in, recruited via an ambiguously worded advert in The Times. Their task was to listen in, translate and précis hours of German, Italian and Russian radio, as well as the Nazis’ internal communications . Many notable figures would spend the war here, among them the future publisher Lord Weidenfeld, the art historian Sir Ernst Gombrich and the poet Geoffrey Grigson. Those who worked at Wood Norton have described a friendly buzz much like at Bletchley, as intelligent amateurs were thrown together to work intensely towards a shared cause. Some have called it the least bureaucratic set-up in BBC history. But, in 1943, Churchill learnt that the Germans were developing their atomic capabilities, and he wanted the place emptied and ready to use as a refuge for the government. After much protest, the monitoring service was moved to Caversham Park, near Reading, where it remains. When the war ended, the engineering training department was established, but with the arrival of the Cold War, Wood Norton soon became, once again, a vital resource. As the threat of a nuclear attack grew, a dedicated BBC bunker became a necessity. Thankfully, the bunker was never needed, although secret documents have revealed that 100 days of broadcasting was lined up and ready to play in the event of a nuclear attack. A mix of comedy, drama and religious programmes, as well as Julie Andrews in The Sound of Music, was kept at the ready until 1993. For years, the main house provided a magnificent entertaining space and was used for BBC board meetings. It also provided the location for several episodes of Doctor Who. But once the Berlin Wall had come down, the justification for maintaining a country house at taxpayers’ expense became harder to sustain. By 2000, Greg Dyke, then the director-general of the BBC, had drawn up plans to slice up the estate and dispose of the main house, which was turned into a hotel and conference centre. Today, as Radio 4 staff arrive for their three-week sojourn in Worcestershire, they will find the place far from buzzing or glamorous. Flaking green signs for the “Wood Norton country house hotel and conference centre” direct you to an empty, moss-cracked car park. Threatening daubed notices tell you to “keep out”. The hotel has gone bust and the hall stands empty, cutting a forlorn figure amid the falling leaves. Some say it should have been kept and turned into a museum to the corporation’s extensive wartime work. Instead, planning permission has been granted to convert it into a retirement home. * The Kingsway tunnels beneath Holborn were built as an air raid shelter in 1942. Described as a “city under a city”, it can house up to 8,000, and was used by Special Operations Executive as a base for covert operations during the war.